The government plans a new high-speed rail network, from London to Birmingham and to Manchester and Leeds, known as HS2. Ministers say it will improve the transport network and boost the economy but there has been controversy about the exact route of the line and its effect on those living near it. Here are the key points about the scheme. The initial plan is for a new railway line between London and the West Midlands, carrying 400m-long (1,300ft) trains, with up to 1,100 seats per train. They would operate at speeds of up to 250mph - faster than any current operating speed in Europe and would travel up to 14 times per hour in each direction. This would be followed by a V-shaped second phase taking services from Birmingham to Manchester and Leeds. Intermediate stations in the East Midlands and South Yorkshire are also planned. What was announced for the second phase? The government's preferred route for the second phase of HS2 is a double-pronged extension linking Birmingham with Manchester and Leeds. The route northwards from Birmingham will have five stops: Manchester, Manchester Airport, Toton in the East Midlands, Sheffield and Leeds. A proposed spur to Heathrow Airport has been put on hold pending a review of UK aviation policy, due to report in 2015. The details are not set in stone, but come ahead of a formal consultation later this year. A final route for phase two is expected to be chosen by the end of 2014. 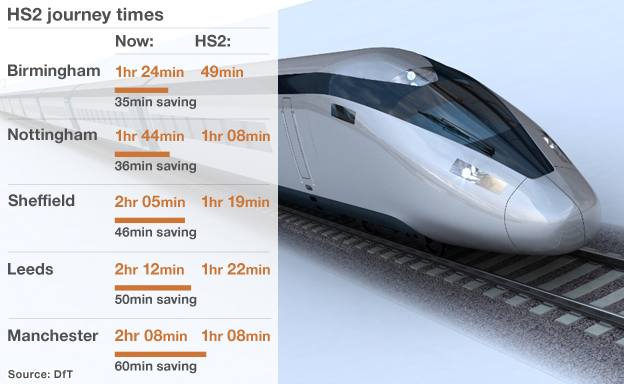 What does HS2 mean for passengers? The Department for Transport says the project will cut Birmingham-London journey times from 1hr 24min to 49min. After the second phase, Manchester-London journeys would take 1hr 8min (down from 2hr 8min), and Birmingham-Leeds 57min (from 2hr). This would effectively reduce journey times between London and Edinburgh and Glasgow by an hour to 3hr 30min. The government believes its creation would free up capacity on over-crowded commuter routes. It also estimates the new line could transfer 4.5 million journeys a year from the air and nine million from the roads, removing lorries from busy routes. The Department for Transport's consultation document says HS2 would offer potential for new direct services to Europe, via the UK's other high-speed line - the Channel Tunnel Rail Link - and to Heathrow. When will it open and how much will it cost? Construction on the London-West Midlands phase is expected to begin around 2017 and open in 2026. This estimate relies on Parliament approving the necessary powers in 2015. The onward legs to Manchester and Leeds could start being built in the middle of the next decade, with the line open by 2032-33. In June 2013 the government revised the cost of the project upwards, due to an increase in the amount of tunnelling required on the route. This took the estimated budget from £32.7bn to £42.6bn at present values - with the cost of phase one increasing from £16bn to £22bn. There has been no announcement on ticket prices. The government says its proposals "assume a fares structure in line with that of the existing railway" and that HS2 could generate sufficient demand and revenues without needing to charge premium fares. It estimates fare revenues of up to £34bn over a 60-year period. Why are ministers so keen on the scheme? The government argues that Britain's rail network is reaching capacity, and that infrastructure owner Network Rail says the southern section of the West Coast Main Line - currently the quickest rail route between London and Birmingham - will be "effectively full" by 2024. Is there opposition in parliament? 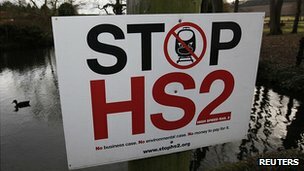 HS2 will pass through around 70 parliamentary constituencies and local groups opposed to the scheme are lobbying their MPs to vote against the plans. Political pressure is mounting on Conservative MPs who will see the route pass through their constituencies, and some have indicated that they may vote against the government's bill when it reaches parliament, including former Welsh Secretary, Cheryl Gillan, Andrea Leadsom and Dan Byles. Is there an economic argument? The government claims the London-West Midlands section alone would create around 40,000 jobs. Groups such as the Campaign for High Speed Rail say there will be added knock-on benefits, while some MPs believe it could be a catalyst for economic growth and help rebalance the economy between the north and south. 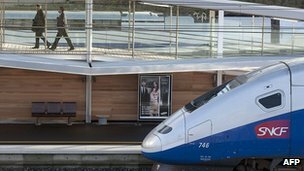 A report commissioned by HS2 Ltd argues that high-speed rail will significantly improve regional economies through the increased potential of both the new faster services and less congested local train services. The report claims that the economies around Birmingham, Derby and Nottingham could be boosted by up to 4% by 2037. The effect around Leeds and Greater Manchester would be smaller, as the improvement to transport links is less marked, with a maximum benefit to the economy of 1.7%. What were the arguments against HS2? 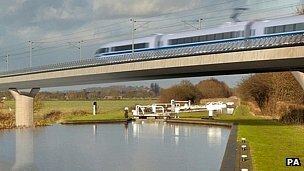 More than 70 groups oppose HS2. One, StopHS2, argues that England's north and Midlands will lose out to London, rather than benefit, and that projections do not take into account competition from conventional rail. Others object on the grounds that it will cut through picturesque countryside. Eighteen councils along the route which are against the scheme, known as the 51m group, say taxpayers cannot afford the line and that it will increase greenhouse gas emissions. Some MPs, including many Conservatives, are worried about its effects on their constituencies. How has the government addressed environmental concerns? Former Transport Secretary Justine Greening announced extra tunnelling and "cutting" through hills from London to Birmingham, which she said would "mitigate" more than half the route. There are new or extended tunnels at Amersham in Buckinghamshire, Ruislip in north-west London, Greatworth in Northamptonshire, Turweston in Buckinghamshire, Chipping Warden and Aston le Walls in Northamptonshire, Wendover in Buckinghamshire and Long Itchington Wood in Warwickshire. The extra tunnelling is a major factor in the increase in costs for phase one of the route. Has it addressed the concerns of those living on the proposed HS2 route? The government is looking into this. Its consultation on HS2 Ltd's property and compensation for phase one closed in January. It included a hardship scheme for residents who need to move during the development of HS2, but are unable to sell their home, and measures designed to "provide confidence in properties above tunnels". Details of its consultation on HS2 Ltd's proposed exceptional hardship scheme for phase two were published in January. What legal action have protesters taken? Mr Justice Ouseley, at the High Court, considered 10 points about the government consultations on the scheme brought by protest groups. In March 2013 he found in favour of the government in nine of these 10. However the consultation into compensation for those affected was ruled "unlawful". Ministers said they would not appeal against the ruling but run the compensation consultation again. 51m was granted leave to appeal on two counts. Were there any alternatives to HS2? A Department for Transport-commissioned study into alternatives identified options including increasing capacity by lengthening existing trains and platforms (at a cost of £3.5bn), remodelling infrastructure to increase service frequency (£13bn) and both increasing capacity and reducing journey times by bypassing slow track sections (£24bn). But infrastructure owner Network Rail says these would cause massive disruption to passengers for limited improvement. How does HS2 compare with current services? Most of the UK's main line inter-city services are limited to 125mph (201km/h), with lower limits in places, while ageing diesel locomotives operate in many areas such as the East Coast Main Line and Great Western Main Line. Eurostar services operate at 186mph (300km/h) on the 68-mile (109km) London to Folkestone line, HS1, which is shared by 140mph (225km/h) Kent commuter services. And with mainland Europe's railways? France's flagship TGV services have been touching 200mph (322km/h) since 1981. They serve not only regional towns but those in Italy and Switzerland, while the 186mph (300km/h) Thalys uses the same track to serve Belgium, the Netherlands, France and western Germany. European Union efforts to ensure compatibility mean services like the German-built InterCity Express, which can reach 180mph, serve major destinations across much of western Europe.